Faraday Rotation (FR) is a classic experiment that brings together elements of optics, electromagnetism, and quantum mechanics. It is traditionally done with DC fields. We are going to introduce the participants to a version where AC fields are used. FR refers to the rotation of light‘s polarization vector as it passes through a medium in the presence of a magnetic field. A more detailed description of the process would include the description of how the presence of the field induces birefringence in the medium, thereby introducing two slightly different indices of refraction for the two circular polarizations whose combination is the incident linearly polarized light. Once this birefringence is introduced, the circular polarizations travel at different speeds and their subsequent recombination beyond the sample appears to result in rotated linearly polarized light. The angle of rotation depends on the field intensity and the length of the path traveled. The material specific constant of proportionality is referred to as the Verdet constant of the material. FR is a topic of fundamental and technological interest. A version of this effect involving ferromagnetic materials is used in optical isolators that are integral part of any photonic circuit. FR is routinely employed to investigate energy-level structures and Zeeman splitting in various materials. Another extraordinary application of the idea is to look at the FR of radio waves from different parts of the universe to estimate galactic and intergalactic magnetic fields. More recently a lot of research has focused on the FR of radio signals from ionosphere (FR due to free charges). Participants will learn about the fundamentals of lock-in based detection and its role in noise minimization. They will learn about the details of the resonant circuit that is used to generate the magnetic fields. Finally, the participants will learn about how FR is used with different types of materials to learn about different types of information that ranges from material properties to reaction kinematics. The experiment will be divided into two parts. The first part will deal with the theory behind the construction and assembly of the FR setup, along with the integration of lock-in detection and the role played by AC fields in facilitating such a detection scheme. The second part of the experiment will consist of taking FR measurements on standard samples like glass and water (dia- and paramagnetic). Depending on the progress made by the participants, they may be introduced to a variation in the measurement scheme like characterizing samples that create multi-harmonic response, and how one can interpret those higher signal harmonics in terms of the magnetic behavior of the samples (superparamagnetic samples). Participants will be expected to have their computers with them and to have had some hands-on experience with data analysis. They will be instructed on proper precautions needed in a high voltage environment. 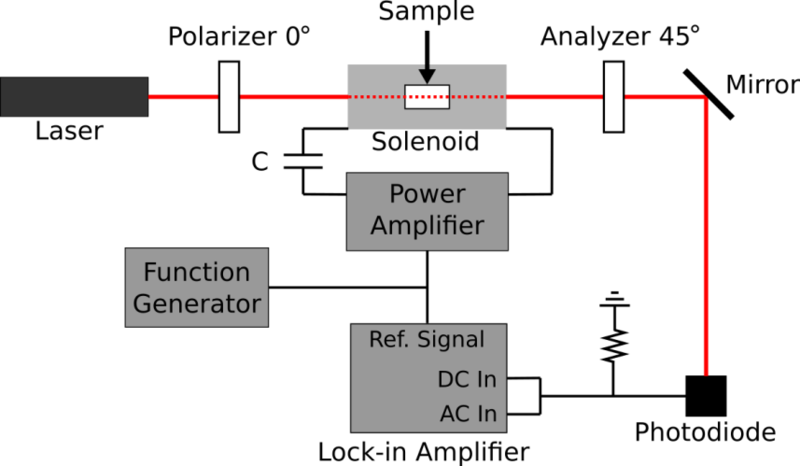 Finally, while the experiment utilizes many items that are commonly found in physics labs (lasers, detectors, function generators), two items that are vital for the experiment are a lock-in amplifier and an audio amplifier. Many refurbished lock-in amplifiers are available from vendors but even a new one can be as low as $1,250. Suitable audio amplifiers can be acquired for $150 - $200.